150 min [ If it's just us, it seems like an awful waste of space. ] 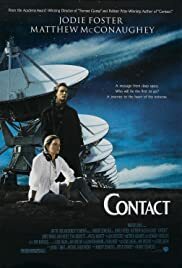 - Contact is a science fiction film about an encounter with alien intelligence. Based on the novel by Carl Sagan the film starred Jodie Foster as the one chosen scientist who must make some difficult decisions between her beliefs, the truth, and reality.